Fry the onion until soft in the olive oil. Add the rice, seasoning and thyme and cook until the rice is hot. Add half the stock and simmer until it is absorbed. Keep adding the rest of the stock a little at a time until it is all absorbed and the rice is cooked. Remove from the heat and stir in the butter, Parmesan and vermouth. Spoon the risotto onto a flat tray and spread out to a thickness of 15mm. Allow to get cold – preferably overnight. To make the salsa, peel, quarter and de seed the tomato. Chop the flesh and place in a bowl. Press the seeds through a sieve to extract the juices and add to the tomato. Discard the seeds and skin. Peel the ginger and cut it into fine shreds. Chop the coriander. Add these to the tomato along with the sugar, lemon juice and oil. To complete the dish, cut out circles of rice cake with an 8-9 cm diameter cutter. Fry in olive oil until crisp and golden. Set aside. Dust the mackerel fillets with flour and shallow fry in a little olive oil until cooked and golden (about 2 minutes on each side). 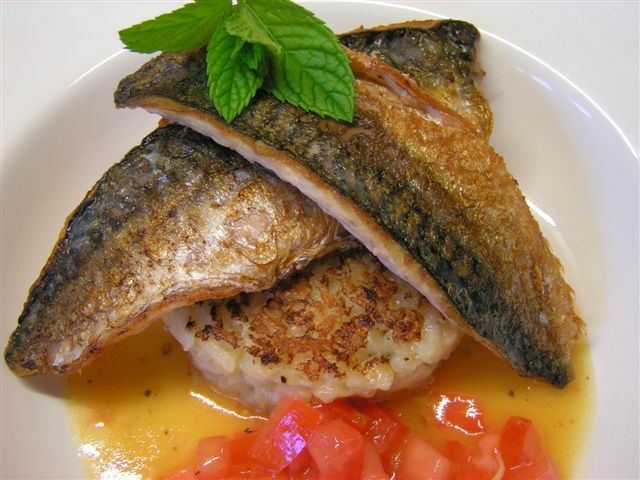 Place a risotto cake on each plate and place the mackerel fillets on top. Serve with the salsa and a simple salad of rocket and watercress.